Horsetail dates back to the prehistoric era, and it is known as one of the most tenacious and persistent weeds in existence. However, it also possesses a range of medicinal properties, and its ability to survive in difficult conditions makes it an easy-to-grow plant that requires little care. 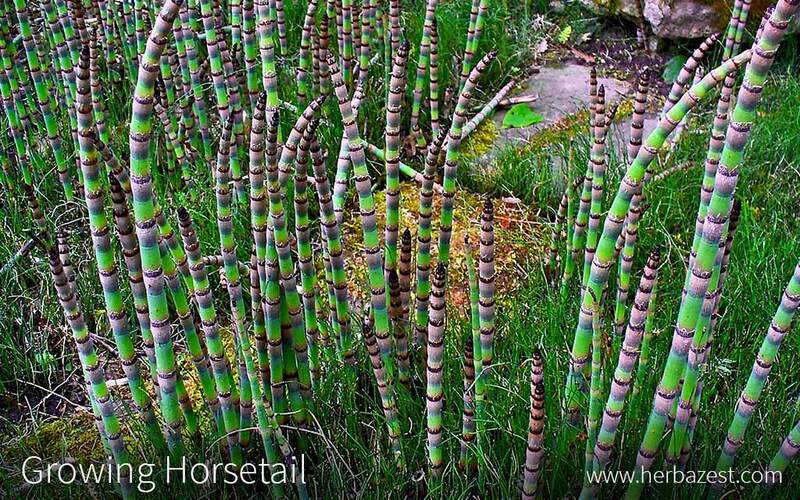 Learn more about growing horsetail to enjoy the benefits of this useful plant. Horsetail is easy to take care of and makes a perfect low-maintenance addition to any backyard or garden, as well as to any aspiring herbalist's collection. The following growing guidelines will be of help for planting horsetail at home. Horsetail is one of the world's most persistent weeds. It dates back to 250 million years ago, and is the only surviving group of plants in its family. It has survived for so long because it is tenacious and it can grow in nearly any type of soil. Horsetail is often found growing in clay or sandy soil, but will also thrive in fields, yards, or gardens that are more conducive to other plant life. It should be planted in an area with plentiful shade. The most important consideration when preparing soil for horsetail is ensuring that there is enough water. Horsetail needs very damp soil to produce its distinctive stems. While drought conditions may not actually kill the plant's roots deep underground, it is unlikely to produce many sprouts without enough water. Before planting horsetail in a garden, it is important to understand that it is known as one of the fastest-growing weeds, as well as one of the most difficult to eradicate. If it is not properly controlled, horsetail may take over an entire garden, yard, or even beyond - it has been observed to take over up to 210 feet (64 m) in one year. It reproduces through spores, but expands more effectively underground, through a system of root-like rhizomes, which makes it difficult to control, since any piece of the rhizomes can sprout a new plant. Horsetail can be found at some nurseries, generally sold as cuttings, which should be kept isolated from other plants, as their rapid expansion may interfere with other plant growth, and its need for large quantities of water may result in the drowning of nearby plants. An ideal place to put horsetail is near a fountain or pond, since it can easily cope with the dampness. Horsetail can also be grown in pots, which is one effective way to control its expansion through rhizome growth. Even if planted in a garden, horsetail can be contained within a large container buried underground to constrain it to the area where it is wanted. Keep in mind that underground barriers must have all sides and a bottom to curtail horsetail growth. Horsetail may also be grown in a pot indoors. Because the plant is so fond of shade, it may be an easier plant to grow indoors than many other sun-loving herbs. Horsetail should still be kept near a window, as it does require some sunshine to survive, but should thrive away from direct sunlight. Keeping the plant inside also reduces the slight risk that it could reproduce by spores and begin growing in another part of an outdoor garden. Just be sure to keep horsetail grown indoors well-watered. The horsetail plant needs very large quantities of water to survive, so it should be watered frequently if there is no source of water nearby, like a lake or pond, or if rainfall has not been sufficient. Some species of horsetail actually only grow in shallow standing water, and common horsetail may be able to grow in up to four inches (10 cm) of water as well. Fertilizer is not necessary for horsetail. Because it is a tenacious weed, it can grow in many conditions that would kill other, more fragile plants. However, a small amount fertilizer may be beneficial. Pruning is almost entirely ineffective with the horsetail plant. It does not need any pruning to keep it healthy, and pruning cannot prevent it from expanding. Removing any part of the plant that grows above the ground will have little to no effect on the rhizome structure, and thus the aboveground stem will simply grow back again later. Because horsetail is itself a weed - one of the hardiest weeds in existence - it is unlikely to be damaged by competition with other weeds. In fact, horsetail will not only prevent weed growth nearby, but may prevent the growth of other plants as well. There are very few dangers that can threaten horsetail, but even this tough plant has a few weaknesses. There are no known pests that attack the horsetail plant. Horsetail itself is often referred to as a pest, even though it is a weed and not an insect, because it often appears unwanted and takes over fields or gardens. Horsetail is also not susceptible to fungus or disease. In fact, horsetail is so resistant to so many varieties of fungus that gardeners often use the plant to create a type of fungicide that can protect other plants from many fungal diseases. Wild animals pose the greatest threat to a patch of horsetail. It is a common source of food for various creatures such as geese, some species of bears, moose, and muskrats, depending on location and the animal's natural habitat. Livestock like horses and cows have also been known to eat horsetail, but a component of many horsetail species is toxic to these animals, so the plant should not be sown anywhere near livestock pastures. The horsetail plant grows two different stems: an early, short-lived, fertile stem that is topped by a cone containing the spores, and a later, sterile stem that grows leaves and lasts until the first frost. The sterile stems are the ones harvested more often, because they provide the medicinal benefits of the plant. Harvesting horsetail's sterile stems is best done in early summer. Cut them off several inches above the ground to ensure that the plant will be able to grow back again easily. The fertile stems, on the other hand, are occasionally, although very rarely, used in culinary preparations, and can be harvested whenever they appear. It is important to note that, if horsetail is being harvested for culinary or medicinal purposes, only one species - common horsetail, or Equisetum arvense - should be used. Many other species of horsetail can grow under the same conditions as common horsetail, but none of the others are recommended for human consumption. Horsetail is most often stored by drying the stems and keeping them in a sealed container, protected from air and sunlight. Like most dried herbs, horsetail can last up to a year if properly stored and can be used to prepare remedies like herbal tea.